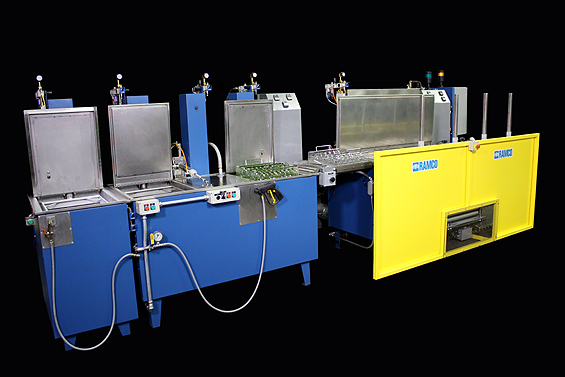 The system below incorporates a fully automatic RAMCO RamTough wash-rinse-dry system prior to a semi-automated FPI module. The application is for a water-washablepenetrant as per ASTM E 1417. The process consists of seven steps – Preclean, Rinse, Dry, Penetrant – Dwell, Water Wash, Hot Air Dry, and Developer. The line runs right to left. 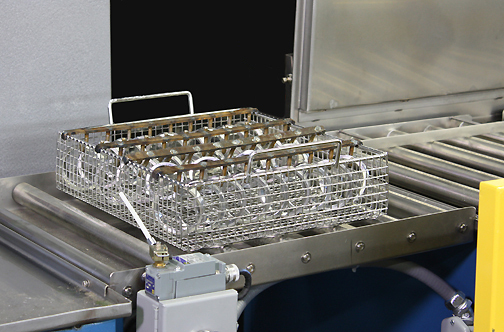 This system processes multiple bearings loaded into baskets. 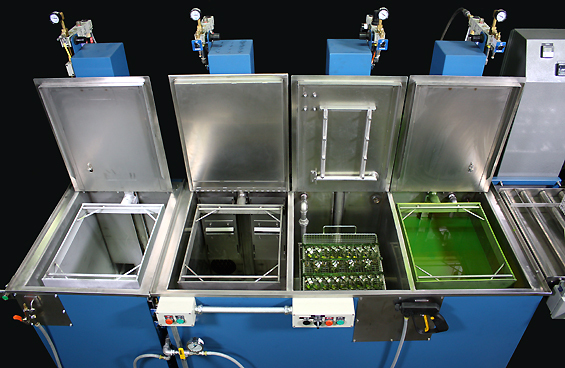 The bearings are first thoroughly wash, rinsed, and dries using a RAMCO Automated AMKD16EWRD Console System. 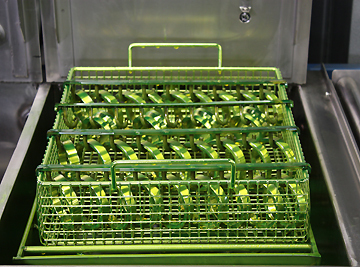 The baskets are taken from the unload station of the automated system and placed on the first transport elevator of a second semi-automated RAMCO Console System consisting of individual penetrant, wash, and dry stages. 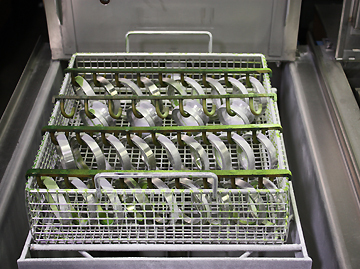 The FPI rinsing module includes strategically placed spray headers (specific nozzle locations and patterns) with zoned platform oscillation between the headers to effectively remove penetrant. Adequate hot water is brought to the system within the temperature and pressure limits set by the specifications on penetrant removal. Water detailing and air blow-off guns are use to ensure that any final traces of penetrant and excess water have been removed respectively prior to the RAMCO Hot Air Knife Drying. After drying the basket is transferred to a RAMCO dry developer powder burst module.